Discus provides the ideal introduction to the DISC profiling system through an online interactive certification course. 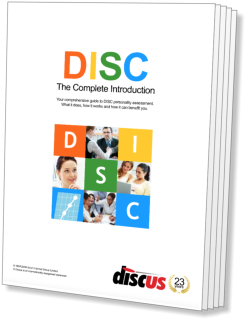 An Introduction to DISC is a great way to get up to speed on the workings of the DISC personality profiling system. Starting from first principles, this video training course builds over four sessions to cover advanced topics such as factor combinations and profile shifts. The course is divided into four sessions that break the material into convenient parts, and each of these sessions consist of a series of video units with additional interactive material. Typically course sessions are completed on consecutive days, with each lasting about sixty minutes, though the courseware is flexible enough that trainees are free to complete the course at their own pace. Each course unit consists of an engaging video explanation to the material, followed by an interactive assessment that helps to reinforce the topic. Units can be repeated if necessary, and also include downloadable course notes to explain the subject in even more detail. Each unit includes a video sequence working through a topic in detail, backed up by clear explanatory graphics and demonstrations. Course units at every level include their own interactive exercises, giving a trainee immediate reinforcement and feedback. Units within An Introduction to DISC each have their own course notes for reference, downloadable as that unit is unlocked. The opening session introduces the basic concepts behind DISC, working through its theoretical underpinnings, as well as looking at practical matters such as how to administer a DISC questionnaire and interpret the results. The second session focuses on the four DISC factors, with an entire unit given over to each of them. These units not only look at the factors themselves, but also the ways they interact with other factors to describe the complexities of a personality. Session 3 moves into more advanced areas, especially the ways the different factors can combine to form personality patterns, and how different DISC graphs interact. This third session also includes a unit looking at the practical applications of DISC. The closing session has a different structure from the others, and consists of only a single unit. This is a series of interactive exercises going back over the entirety of the course content. When this final session is completed, the course will provide a customised certificate of completion. You don't have to be a Discus user to sign up for An Introduction to DISC. The full course is available to anyone online, and it focuses on the DISC profiling system rather than Discus specifically, so the course content is useful to anyone with an interest in DISC profiling at any level. A Four-day Course: The course sessions are designed to be completed over four days, but the courseware will adapt to each trainee's needs. Convenient Course Units: There are a total of thirteen units within the course, each including video training and an interactive element. Course Notes on Demand: As each new unit is unlocked, a set of downloadable course notes becomes available for that unit. Completing the Course: The final course unit is given over to a programme of exercises designed to confirm and reinforce what a trainee has learned. Course Access: An Introduction to DISC is available online for just $399, but the course is also included completely free of charge if you sign up for a Discus package at the Extra level or above.